The Rochester Rock Art Panel is located about 4 miles due east of Emery, Utah. There are more than one panels of petroglyphs with hundreds of various images but one panel in particular that has an image resembling a rainbow is iconic for the site. The vast majority of the rock art is composed mostly of petroglyphs that are typical of the Fremont culture with a strong Barrier Canyon influence. Others are more recent and probably made by settlers or even later. Getting to the site is pretty straight forward. If coming from Highway 10 turn east on County Road 801, the Moore Cutoff Road, about 3.4 miles north of Emery. Follow CR 801 east for about 0.6 miles to the turnoff for CR 805 on the right hand side of the road. If traveling from the Green River, Utah direction on Interstate 70 take exit 116 and follow it for 19.1 miles to the turnoff for CR 805 on the left hand side of the road. Continue on CR 805 for 3.7 miles to the trailhead. Passenger cars should find the gravel road suitable in most any weather. The trail isn't flat and it is a little rocky and primitive but it is only a half mile to the petroglyphs and the elevation change is only about 80 feet. This tangle of brush where the trail crosses the wash must mark the flash flood high water line. There is a trail marker pointing the way sticking out of one of the piles. The trail climbs along the side of the hill toward the Rochester Panel which is perched at the point of the ridge where this side canyon joins the main branch of Muddy Creek. Watch for a few petroglyphs on the cliffs to the right of the trail in this area. The easiest route to follow stays high on the ridge. It is hard to see but from the ridge looking west across Muddy Creek there is a cool looking horse or burro with a rider. This is the main panel of petroglyphs but it is by no means the only one. 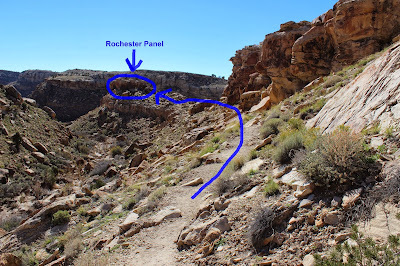 Some people think that the missing parts of the panel where the lighter colored rock is exposed were caused by vandals that were trying to chisel off sections to collect. We have seen that at other sites but they always had noticeable chisel marks left behind. The main panel has a big diversity of images. Another panel along the ridge. We noticed a couple of images that stood out from the rest because they appeared to have been painted red at one time. The same affect may have been made by burning them with a torch but regardless they are nonetheless peculiar. There are a few petroglyphs on the opposite side of the cliff as well. These images are between a couple of boulders. There appears to be a white barrier canyon style pictograph on the left in this picture. We figured that the heart image on this boulder was a strong indication that this panel was made recently. That wasn't enough to keep me from browsing through every alphabet in the world both ancient and modern. What we found was that the horizontal bars with the dots are part of a vigesimal (base 20) counting system used by the Mayan and related cultures. Each bar represents 5 and each dot is a 1. That means the characters above the first box represent 13 and the second box 11. That fact doesn't authenticate anything about these pictographs but it does add a little intrigue. The Rochester Panel is definitely worth the trip although we combined it with 3 other sites to make a full day out of it. Emery County has a PDF document that you can download that mentions most of the interesting places to visit in their area. Some of their mileages can be a half mile off and the I-70 exits are miss numbered but the document is still a valuable resource to get you started. The Rochester Panel is one of the areas crowning jewels. If you would like to see it for yourself then all you have to do is 'Take a hike'.